MENLO PARK, Calif., Sept. 17, 2018 /PRNewswire/ -- Silence may be golden, but most workers feel they're more productive at the office when listening to music, new research from staffing firm Accountemps shows. Eighty-five percent of survey respondents who are able to do so say they enjoy turning on the tunes at work. Employees ages 18 to 34 appreciate music while working the most (95 percent), compared to those ages 35-54 (84 percent) and 55 and older (66 percent). More than seven in 10 (71 percent) professionals said they are at least somewhat more productive when music is playing at the office, with pop, rock and country songs providing the biggest boost. (e.g., workers must wear headphones). No — it is not allowed. 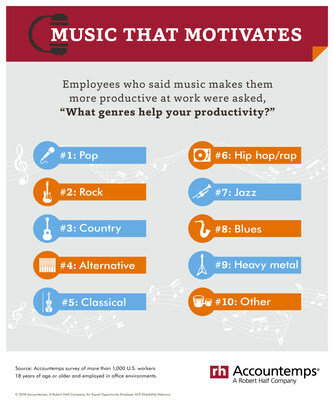 View infographics showing how music affects workers' productivity and the types of tunes that help the most. "While music can be a stress reliever or source of motivation for many workers, it can be a distraction for others," said Michael Steinitz, executive director of Accountemps. "Those who want to listen to music in the office need to be aware of company policies and considerate toward their colleagues." When listening to any type of audio at work, be respectful of your colleagues, who may not share the same tastes as you. Sing or hum along to your favorite tunes. Tapping your hands or feet will likely annoy colleagues, too. Keep the volume low enough to hear your phone ring or someone calling your name. Have music blaring when communicating with coworkers. They deserve your full attention. Use headphones if you work in a shared office space to avoid disrupting coworkers. When someone approaches you, be quick to respond to them. Abuse the privilege. Consider listening to music when the office isn't busy or you're doing solo work. The online survey was developed by Accountemps and conducted by an independent research firm. It includes responses from more than 1,000 U.S. workers 18 years of age or older and employed in office environments.